More often than not, the illumination intensity requires a level of control. For those time, the LVDC offering was developed to be an accurate low voltage and highly economic solution when compared to competitive offerings in the market. 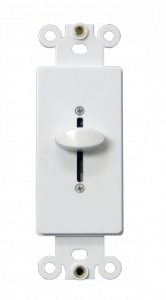 With both rotary and slider interfaces available and reverse polarity protection. the LVDC will meet demanding needs and deliver impressive results for many applications. * All specifications are nominal values and subject to change without prior notification.